As the Earth continues to heat, paleoclimate evidence suggests transient reversals will result in accentuating the temperature polarities, leading to increase in the intensity and frequency of extreme weather events. Pleistocene paleoclimate records indicate interglacial temperature peaks have been are consistentlysucceeded by transient stadial freeze events,such as the Younger Dryas and the 8.5 kyr-old Laurentideice melt, attributed to cold ice melt water flow from the polar ice sheets into the North Atlantic Ocean. The paleoclimate evidence raisesquestions regarding the mostly linear to curved future climate model trajectoriesproposed for the 21st century and beyond, not marked by tipping points. However, early stages of a stadial event are manifest by a weakening of the North Atlantic overturning circulation andthe build-up of a large pool of cold water south and east of Greenland and along the fringes of Western Antarctica. Comparisons with climates of the early HoloceneWarm Period and the Eemian interglacial when global temperatures were about +1oC higher than late Holocene levels. 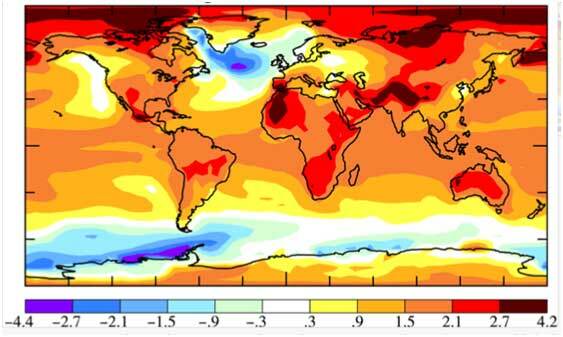 The probability of a future stadial event bears major implications for modern and future climate change trends, including transient cooling of continental regions fringing the Atlantic Ocean, an increase in temperature polaritiesbetween polar and tropical zones across the globe, and thereby an increase in storminess, which need to be taken into account in planningglobal warming adaptation efforts. 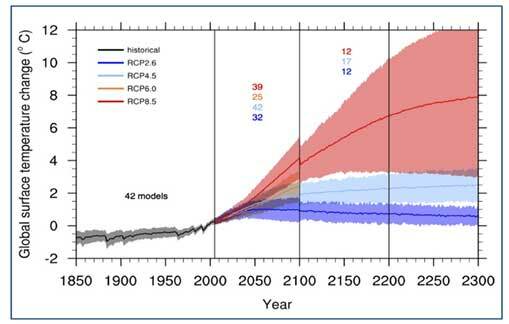 Reports of the International Panel of Climate Change (IPCC), based on thousands of peer reviewed science papers and reports, offer a confident documentation of past and present processes in the atmosphere, including future model projections (Figure 1).When it comes to estimates of future ice meltand sea level change rates, however, these models contain a number of significant departures from observations based on the paleoclimate evidence, from current observations and from likely future projections. This includes departures in terms of climate change feedbacks from land and water, ice melt rates, temperature trajectories, sea level rise rates, methane release rates, the role of fires,andobserved onset of transient stadial (freeze) events. Early stages of stadial event/s are manifest by the build-up of a large pool of cold water in the North Atlantic Ocean south of Greenland and along the fringes of the Antarctic continent (Figure 2). Hansen et al. (2016) (Figure 2)used paleoclimate data and modern observations to estimate the effects of ice melt water from Greenland and Antarctica, showing cold low-density meltwater tend to cap increasingly warm subsurface ocean water, affecting an increase ice shelf melting,accelerating ice sheet mass loss (Figure 3) and slowing of deep water formation (Figure 4). Ice mass loss would raise sea level by several meters in an exponential rather than linear response, with doubling time of ice loss of 10, 20 or 40 years yielding multi-meter sea level rise in about 50, 100 or 200 years. Linear to curved temperature trends portrayed by the IPCC to the year 2300 (Figure 1) are rare in the Pleistocene paleo-climate record, which abrupt include warming and cooling variations during both glacial (Dansgaard-Oeschger cycles; Ganopolski and Rahmstorf 2001;Camille and Born, 2019) and interglacial (Cortese et al. 2007) periods. Hansen et al.’s (2016) model includes sharp drops in temperature, reflecting stadial freezing events in the Atlantic Ocean and the sub-Antarctic Ocean and their surrounds, reaching -2oC over several decades (Figure 5). 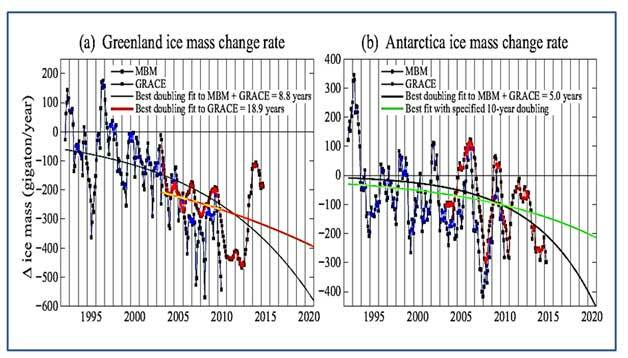 Figure 3.Greenland and Antarctic ice mass change. GRACE data are extension of Velicogna et al. (2014) gravity data. MBM (mass budgetmethod) data are from Rignot et al. (2011). Red curves are gravity data for Greenland and Antarctica only; small Arctic ice caps and ice shelfmelt add to freshwater input. Climate model projections for the 21st to 23rdcenturies need to take paleoclimate evidence more fully into account, including the transient stadial effects of ice melt water flow into the oceansand amplifying feedbacks of global warming from land and oceans. Radiative forcing, increasing with concentration of atmospheric greenhouse gases and rising by about 0.04 Watt/m2/yearover the last 50 years,totaled by more than 2 Watt/m2, equivalent to ~3.0°C (~1.5°C per W/m2). The rise of mean global temperatures to date by 0.9°C since 1880therefore represents lag effect, pointing to potential temperature rise by approximately two degrees Celsius. A further rise in global temperatures would be enhanced by amplifying feedbacks from land and oceans, including exposure of water surfaces following sea ice melting, reduction of CO2 concentration in water, release of methane and fires. Climate change trajectories would be highly irregular as a result of stadial events affected by flow of ice melt water into the oceans. 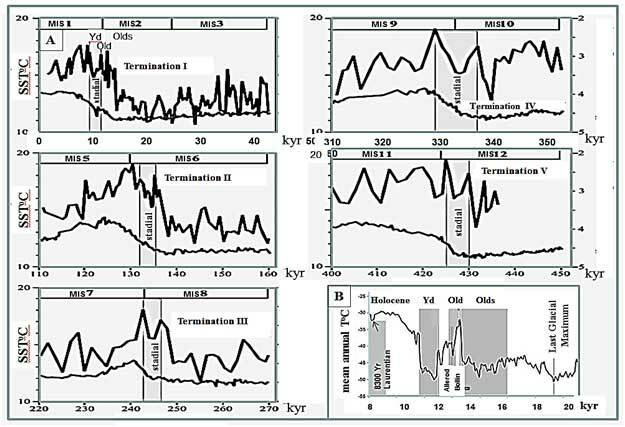 Whereas similar temperature fluctuations and stadial events occurred during past interglacial periods (Cortese et al. 2007; Figure 6), when temperature fluctuations were close to ~1oC, further rises in temperature in future would enhance the intensity and frequency of extreme weather events, entering uncharted territory unlike any recorded during the Pleistocene, rendering large parts of the continents uninhabitable. Figure 6. A. Evolution of sea surface temperatures in 5 glacial-interglacial transitions recorded inODP 1089 at the sub-Antarctic Atlantic Ocean. Lower grey lines – δ18O measured on Cibicidoides plankton;Black lines – sea surface temperature. Marine isotope stage numbers are indicated on top ofdiagrams. Note the stadial temperature drop events following interglacial peak temperatures, analogous to the Younger Dryaspreceding the onset of the Holocene (Cortese et al. 2007).B. Mean temperatures for the late Pleistocene and early Holocene.